Every industry is going through a major transformation where they are under competitive pressure to provide service across multi-cloud, multi-device internet of things (IoT), and multi-channel environments at the highest efficiency, speed, and lowest cost. Service management is being disrupted by technologies like AI/ML, chatbots, and virtual agents to help businesses manage these increasingly complex landscapes. Cognitive automation capabilities are transforming the agent experience to resolve issues quickly and accurately. Hence, business leaders who are highly cognizant of this wave are embracing and applying cognitive technologies to solve real business challenges and get a competitive edge in the market. Learn how BMC is helping business leaders solve real business challenges who by applying cognitive technologies get a competitive edge in the market. Vidhya Srinivasan is the Head of Marketing for the Digital Service Management Business Unit. Prior to BMC, Vidhya was at ServiceNow where as a Marketing leader she led Community and Digital strategies. She holds a Masters in Information Systems and an MBA. Her passion includes customer experience, digital engagement and advocacy. Everybody talks about Operations “Shifting Left” but Developers also need to “Shift Right” and start thinking about how applications are orchestrated in production. Taking a Jobs-as-Code approach means putting all the workflows and operational instrumentation in the CI/CD pipeline to ensure you get the acceleration and increased quality that comes from automated testing and deployment. Join this session and hear how you can orchestrate your workflows with a DevOps enabled approach. Back in the day – five to ten years ago – business applications were orchestrated with purpose built enterprise solutions owned and managed exclusively by IT Operations. Along comes the concept of DevOps and the SDLC transitions to the fully automated delivery pipeline you know today where everything is expected to be embedded into the code. Since developers know and love scripting, or cron or Jenkins or whatever automation tool they have access to, it became those tools they used to build their operational instrumentation and called it a day! How would DevOps folks react if you suggested they should manage their delivery pipeline with cron? Yeah, that’s how everyone should react to managing payroll or inventory or payments or any sophisticated business service with Jenkins or Puppet or Chef or ANY tool not purpose built for such functionality. Join us to learn how PayPal, Amadeus and similar enterprises are orchestrating their critical business applications with a DevOps enabled, Jobs-as-Code approach. Every industry is going through a major transformation where they are under competitive pressure to provide service across multi-cloud, multi-device (IoT) and multi-channel environments at the highest efficiency, speed, and lowest cost. 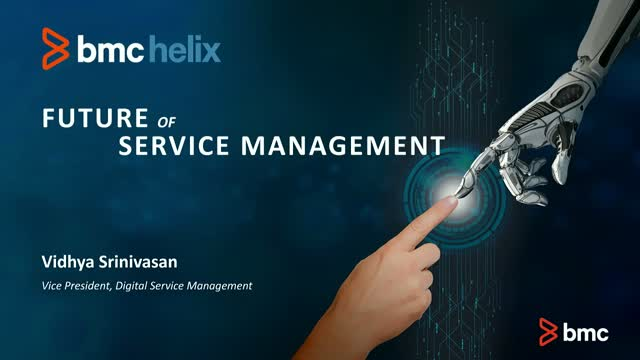 Service Management as a category is being disrupted by technologies like AI/ML, Chatbots and virtual agents to help businesses manage these increasingly complex landscapes. Learn how BMC is helping business leaders solve real business challenges who by applying cognitive technologies get a competitive edge in the market. - How to deliver the immediacy and accuracy of service end-users expect, on the channel of their choice. - How to automate service desk processes and leverage containers as a delivery model for increased business agility and reduced time for upgrades and DevOps integrations. - How to deflect lower-level service calls, scale support, and reduce costs with chatbots and virtual agents. - How to select the right tools for managing, securing, and optimizing your investments. - How to deliver everything-as-a-service with intelligent omni-channel experiences. - How to transform with cognitive capabilities to improve productivity, reduce costs and resolution time. In the digital era, success is predicated on delighting customers, engaging employees, innovating operations and transforming business models. Managing IT at the pace and complexity demanded is not easy. Hear how to leverage Cognitive Service Management to transform businesses through AI, machine learning and automation. One of the first challenges in a big data project is how to ingest data into a data lake from disparate systems across the organizations. Add to this streaming data from devices, sensors and social media and just step one of the journey in big data becomes overwhelming. The key to delivering scalable big data pipelines is automation. Join this session how to learn how to build scalable data lakes by using an automation strategy that will also extend beyond the data lake stage to processing and analytics of this data. Basil Faruqui is lead solutions manager at BMC, where he leads the development and execution of big data and multicloud strategy for BMC’s Digital Business Automation line of business (Control-M). Basil’s key areas of focus include evangelizing the role automation plays in delivering successful big data projects and advising companies on how to build scalable automation strategies for cloud and big data initiatives. Basil has over 15 years of industry experience in various areas of software research and development, customer support, and knowledge management. With the promise of agility and reduced costs, organizations are counting on cloud computing to help with their digital transformation. Yet organizations continue to get sticker shock when they move applications and workloads from on-premises to public cloud. TrueSight Cloud Cost Control provides visibility into current and future costs, simulated migrations and the insight needed for optimization resources. Keep your digital transformation on track by eliminating surprises and wasted operating spend with TrueSight Cloud Cost Control. Join this webcast with BMC Software Product Manager, Shyamal Patel, as we discuss how to accelerate your digital transformation and cloud migration strategies without the high price tag. Efficiency, speed and accuracy are critical capabilities for any help desk service manager. And while there is no doubt your staff is intelligent, that needs to be paired with service desk software that allows them to be intelligent super heroes. Learn why cognitive intelligence can assist IT and business users to complete tasks faster and improve productivity and agility throughout the service management processes and experiences. Important capabilities such as virtual chat, smart recorder, knowledge article checks and categorization proposals are essential components to be intelligent software that supports your intellectual workforce. What are the top issues facing the ITSM industry and how can you find a practical and effective path through all of the hype? IT Service Management is at a critical crossroads. The pre-eminence of ITIL® is being challenged and new ideas like DevOps and Bi-modal IT are gaining adoption. Catalog sprawl is plaguing the vast majority of enterprises today. About half of all corporations run more than five service catalogs concurrently. As workers are becoming less productive sifting through endless portals, shadow IT starts to creep in, leaving the whole company vulnerable to security and compliance issues. So what can IT do?